The most recent expression of virtuoso craftsmanship by the Manufacture Jaquet Droz, La Ligne Bleue pushes back the limits of the Grand Feu enamelling technique to obtain a colour of unique depth and luminosity: the Jaquet Droz blue. A colour of the imagination, reverie and meditation, blue has always inspired Jaquet Droz which, from its origins to the present day, has often chosen to array its creations in this fabulous shade. Starting in the Enlightenment, its pocket watches and precious snuff boxes celebrated every conceivable nuance of blue. 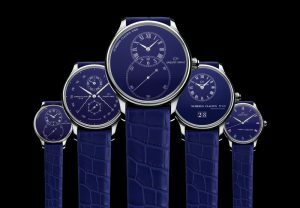 Remaining true to its avant-garde spirit, the Manufacture from La Chaux-de-Fonds, Switzerland, has developed a magnificent collection of five timepieces, each available in a limited edition of 8 exclusive watches featuring a dial enamelled with a remarkably intense blue… the Jaquet Droz blue. In creating these watches — the result of several years of work, great craftsmanship and an unshakeable certainty that the only goal of the creative mind is to surpass itself — house designers and artisans took an aphorism of the French artist Yves Klein (“One does not represent the infinite, one produces it”) and made it their own. Out of this conviction came La Ligne Bleue, the latest illustration of the Manufacture’s watchmaking genius and unceasing inventiveness. Perfect, radiant, and incredibly pure, this shade of blue is precisely what Jaquet Droz was striving for. This rich, deep and luminous blue is a natural candidate for Grand Feu enamelling, the Manufacture’s most famous technique. This feat of technical prowess and superior craftsmanship calls for a painstaking alchemy of fine powders and perfect mastery of a firing process whose limits Jaquet Droz has continued to test. Whereas the ivory or black enamel needs 10 to 15 firings, the blue requires no fewer than 20. Before each one, the dial surface is dusted with an imperceptible layer of powder, no more than a millimetre thick. This meticulous superposition of layers is what gives the blue its special radiance and distinctive hue. Fully mastered by the Manufacture’s artisans, who perform more than forty operations by hand, the technique calls for tremendous dexterity, patience and meticulousness. Even so, less than one dial out of ten passes inspection to adorn one of the five providential models of La Ligne Bleue: the Grande Seconde, the Grande Seconde Medium, the Grande Date, the Quantième Perpétuel and L’Origine Email. Given the extreme complexity involved and the exclusive image of the brand, Jaquet Droz decided to manufacture each model in a limited edition of eight that would feature all of the codes emblematic of the Manufacture. A watch for private life, it measures out precious moments and bears two overlapping dials forming the emblematic figure eight that has become the reference in Jaquet Droz design. Nestled inside its white gold case, the blue dial pays homage to the magic of each passing moment. Beneath an off-centred subdial situated at 12 o’clock, two easy-to-read date apertures display the date. This elegant, indispensable complication, evoking all of the dimensions that one day can have, is dedicated to the colour blue. A timepiece representing great technical difficulties, the Quantième Perpétuel “knows” how long each month lasts and when to correct for a leap year. With its automatic memory mechanisms concealed inside a white gold case, this treasure boasts a dial enamelled in blue, a rare colour reflecting the watchmaker’s virtuosity. With its sleek lines, highlighted by the sobriety of its Roman numerals, and its delicate fusion of tradition and modernity, L’Origine Email displays the aesthetic values dear to the Manufacture. The blue enamelled dial stresses the evocative power of this timepiece, available in a forged case of stainless steel. 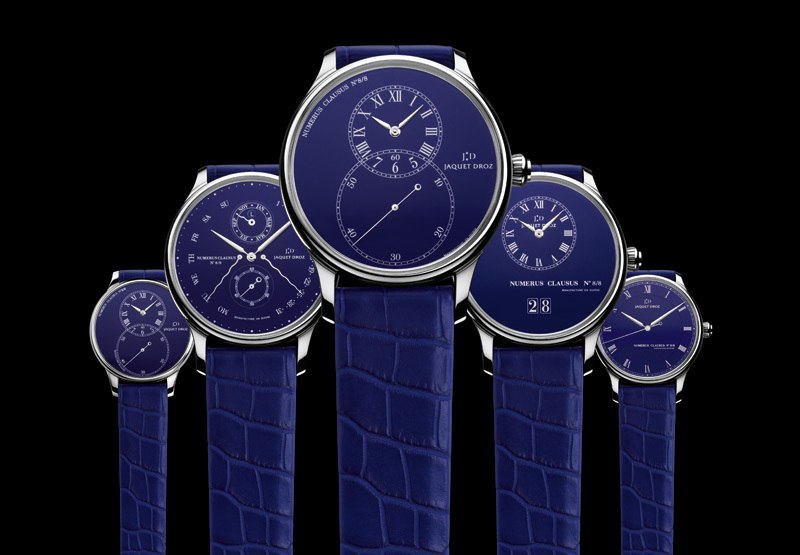 Today, these exclusive watches are a perfect example of the new challenge taken up by Jaquet Droz, which is to bring the past and present together in creations of great beauty and creativity, offering a handful of connoisseurs a rare experience with a marvellous colour: the Jaquet Droz blue.